Bradshawe said he asks that question once each cruise and has found something interesting. Hillary Clinton has now been the most popular answer on five consecutive cruises. Not only that, but no Republican candidate has even finished in the top two choices on any of the five cruises. The poll isn't scientific because it only includes Regal's passengers. The writer seemed relieved when he realized that many more than half the passengers were from California, which does tend to have a rather liberal population, so that would tend to favor Senator Clinton. If you hear that Regal Princess is listing decidedly to the left, it probably just has something to do with Princess trying to make the passengers comfortable. Note: Link was valid at time of publication. 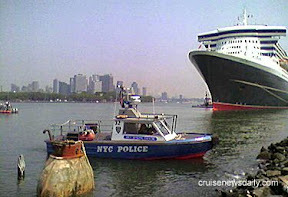 Updated 6:30pm: About 10:30 this morning, an NYPD detective noticed three men in the East River near the Brooklyn Cruise Terminal - and uncomfortably close to the security zone surrounding Queen Mary 2 which is in port today. What raised suspicion is that two of the men were in an inflatable boat, and the third was in a submersible vessel which was partially submerged. The NYPD's harbor unit took the three into custody, and the Dept of Homeland Security subsequently determined that there was no connection to terrorism. So far, the three have only been charged with violating the security zone around QM2. A Coast Guard spokesperson told CND that it appears the incident may have been a publicity stunt by one of the men to gain attention for his business and it was probably just coincidental that QM2 was there. Cunard's QM2 is in port on its regular turnaround between transatlantic crossings and departed on time this evening. The photo above (courtesy of the USCG) shows the submarine in the foreground within 200 yards of Queen Mary 2. There is a series of seven photos of the craft on the WABC website. (You will need to click next at the far right side to cycle through them.) More photos are located on the local Fox website. Note: Links were valid at time of publication. Queen Mary needs help - the original Queen Mary, that is. The ship has been in constant service since it was constructed at the John Brown Shipyard in the late 1920's and early 1930's. The RMS Queen Mary Foundation has launched a $10-million preservation campaign in connection with the ship's 40th anniversary year in Long Beach. They plan on funding it $1 at a time by asking patrons to "Adopt A Rivet." 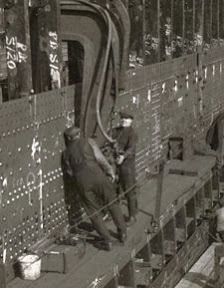 Shown at left is some of the rivet work being done. "This program makes it affordable for anyone to contribute to Queen Mary preservation projects," said Bruce Vancil, executive director of RMS Queen Mary Foundation. "Some people are sending a dollar or two, and others are passing the hat at the office or spreading the word and sending in hundreds. It's all welcome and will be put to good use," he added. If you wish to donate, you may send $1 for each rivet you wish to adopt (limit 10,000,000) and receive an Adopt A Rivet Certificate upon request via e-mail. Donations should be sent to Adopt A Rivet, RMS Queen Mary Foundation, 1126 Queens Highway, Long Beach CA 90802. Donations are tax deductible to the fullest extent allowed by law. 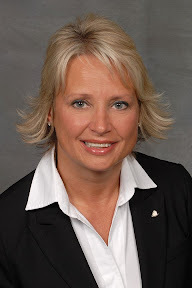 Terri Haas has joined Costa Cruises as the Director of Field Sales for North America. Carnival Cruise Lines confirms that while docking in New York this morning, about 7am, Carnival Victory came into contact with a part of the pier. There were no injuries to any passengers or crew members, but there was minor damage to the ship and the pier. Media reports indicate the damage was confined to an overhang at the pier and a 3-foot crease in bow of the ship. Carnival Victory was returning from a 5-day cruise to Canada that departed last Saturday (July 28). It is scheduled to leave on a 4-day cruise to Canada this afternoon. Carnival says they expect it to sail as scheduled today, and that a comprehensive investigation is already underway to determine the exact cause of the incident. Carnival confirms that Carnival Victory sailed today as scheduled. Update on Black Watch: Fred Olsen's Black Watch was cleared by UK health authorities to sail today as scheduled after a "super-chlorination" and thorough cleaning of all water-related fixtures such as shower heads, swimming pools, whirlpools, etc. Earlier Swedish authorities confirmed that two of the passengers have tested positive for Legionnaires Disease, but also confirmed that all water samples taken from the ship tested negative, making it probable that the passengers contracted the disease in one of the ports. 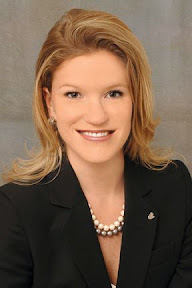 Costa announced that Dana Dominici has been promoted to Director of Public Relations for North America. Dominici joined Costa in February 2006 as a public relations manager. She came to the PR side of the industry from the cable news production side. Carnival Corp, the owner of the classic Queen Elizabeth 2, won the rights to the internet domain QE2.com before the World Intellectual Property Organization today. Carnival found that Prime Choice, a web design and hosting company in Virginia, had registered the domain in August 2000 but never developed it. Carnival, on the other hand, owns the trademark on "QE2" and "Queen Elizabeth 2." The ship was built in 1969. The WIPO found that Prime Choice "lacks rights or legitimate interests in respect to the domain name." This is believed to be a case of "cybersquatting" where someone without any connection to the name registers it either in hopes of eventually selling it to someone with a legitimate claim to it, or to divert traffic to their own website. Either way, for the last several years, the practice hasn't been allowed under internet rules, and in these cases the domain is transferred to the rightful owner by the WIPO. Had Prime Choice developed an active website with a name such as Quick Edward's Second Website, Carnival may have had a tougher time before the WIPO. A Carnival spokesperson today told CND that the company has no immediate plans to utilize the domain, but they were "protecting [their] intellectual property rights." Ironically, Carnival Corp just recently made a deal to sell the classic liner at the end of next year. 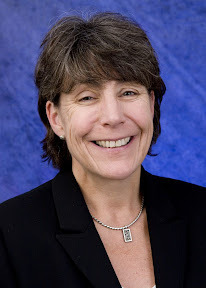 Holland America announced today that Fran O'Connor has been promoted to Director of Online Marketing. O'Connor will direct the company's online strategy and implementation, enhance the website, manage initiatives to increase web traffic and expand the company's international online efforts. She joined Holland America in 2005 managing online communications. For those of you having trouble with the line's website, her e-mail address wasn't given. Two of the passengers have now tested positive for the legionella bacteria, legionnaires disease. Swedish officials said the water samples taken from the ship have tested negative for the bacteria. That would tend to indicate that the passengers contracted the disease somewhere ashore, and the cruise ship was not the source. Nonetheless, the ship is being thoroughly disinfected before the next sailing. The cruise line has refunded passengers 25% of their cruise fare for the cruise which was terminated two days early. Black Watch is now back in England being "deep cleaned" and preparing for its next cruise on Wednesday. Seattle TV station KOMO gets our award for running the biggest nonstory lately. Their headline in a story posted Sunday was "Tragedy-stricken cruise ship returns to Seattle." I wondered what had happened to what ship leaving Seattle over the weekend. The story turned out to be about Sun Princess. Last Tuesday, four passengers from the ship had been killed in a plane crash during the ship's Ketchikan port call. KOMO covered the story at that time. So what was the story they covered on Sunday? They didn't interview anyone traveling with either of the couples who returned without them. There was a brief mention in the article that one passenger said the cruise line had handled it tastefully onboard and by being forthcoming with information onboard. The ship returned as scheduled on Sunday. There wasn't one piece of information in the article (or the linked video clip) that wasn't already known or routine. The only way this would have been a story on Sunday would have been if Sun Princess hadn't returned to Seattle as scheduled. But it did, so the story was .... what?